Troops cleaning up the oil slick. 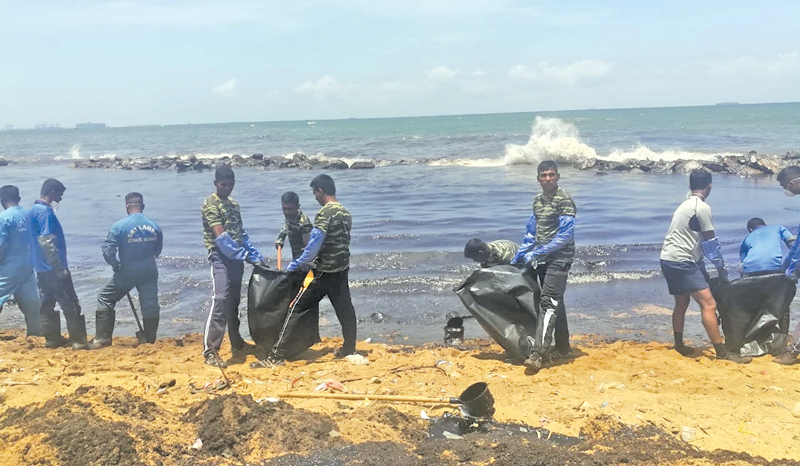 Troops of the 1 Sri Lanka Armoured Corps (SLAC), 8 Sri Lanka Light Infantry (SLLI) and 2 Sri Lanka Army Service Corps of the Security Force Headquarters - West (SFHQ-West), assisted in clearing the oil slick in the coastal belt around Muthurajawela on Sunday. This was on the directions of Army Commander Lieutenant General Mahesh Senanayake and Security Forces - West (SF-West) Commander Major General Sathyapriya Liyanage. The oil slick is believed to have been either leaked or spilled from a vessel. It was spot by the Coastal Guards before Army and Naval troops were informed. Three Officers and 58 Other Rankers of the Army attended to the emergency need and cleaned up polluted waters as it would pose a threat to the environment.